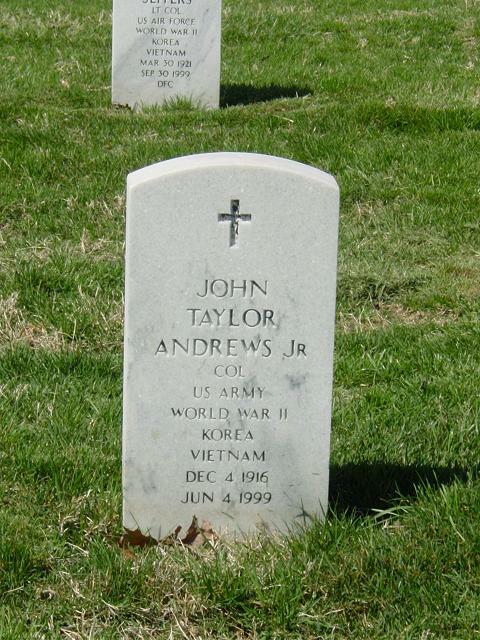 John Taylor Andrews Jr., 82, a retired Colonel in the Army Ordnance Corps, died of cardiovascular collapse June 4, 1999 at his home in Alexandria, Virginia. Colonel Andrews entered the Army in 1939 and served in Europe during World War II. After the war, he graduated from the Command and General Staff College and the Army War College. He held posts in Europe and the Far East and was commander of the Pueblo Army Depot in Colorado when he retired from active duty in 1972. He then settled in the Washington area, where he served for a time on the board of the Baltimore Tool Works and the board of the National Institute for Certification in Engineering Technologies. He also was a volunteer and newsletter publisher with RSVP and a member and newsletter publisher for St. Luke's Episcopal Church in Alexandria. Colonel Andrews, a Baltimore native, had served in the merchant marine. He was a 1938 graduate of the University of Maryland and received a master's degree in mechanical engineering from the Rensselaer Polytechnic Institute. His military decorations included two awards of the Legion of Merit, the Army Commendation Medal and two awards of the National Defense Service Medal. Survivors include his wife, Lillian Wright Andrews of Alexandria; four children, John Andrews III of Atlanta, Susan Lederer of Raleigh, N.C., Pam Andrews of Belmont, Mass., and George Andrews of Berthoud, Colo.; a sister; 10 grandchildren; and three great-grandchildren. brother of Gertrude A. Soto, Puerto Rico. Also survived by ten grandchildren and three great-grandchildren. Services at 1 p.m. at Fort Myer Chapel. Interment Arlington National Cemetery with full military honors. In lieu of flowers, contributions may be made to the American Heart Association, 7203 Poplar St., Annandale, Virginia 22003.